Preowned. Excellent condition. 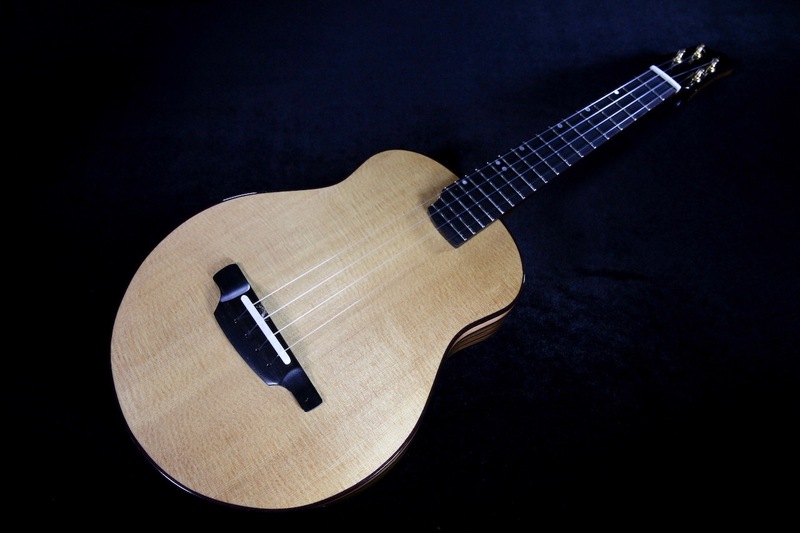 Beautiful T-14 Tenor Ukulele by master luthier Mark Roberts of Portland, Oregon. Mark Roberts has maintained a lifelong passion about creativity and understanding the nature, patterns, and systems of the world around us. 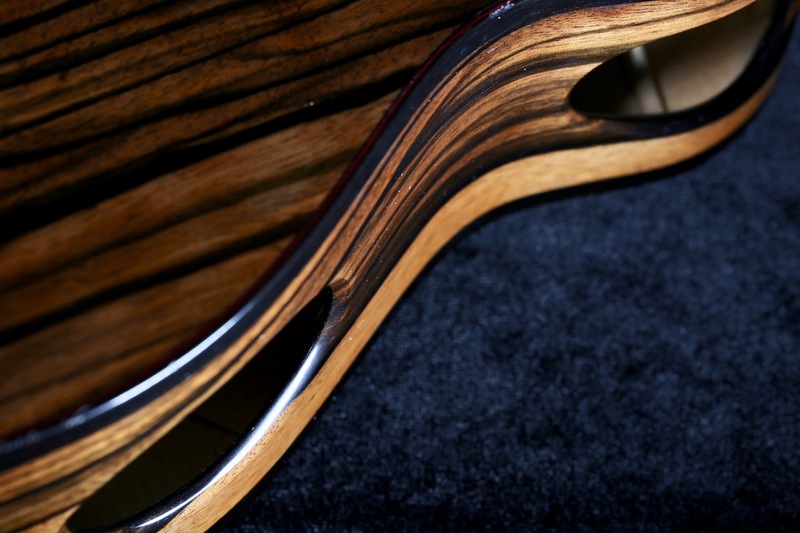 An extensive background in all disciplines of fine art, furniture design, and product design have uniquely crafted his approach to design and craft fine instruments. Mark’s experience as a product designer and his beneficial study under Charles Fox, at the American School of Lutherie, have uniquely positioned his contemporary sensibilities to design and approach to building. 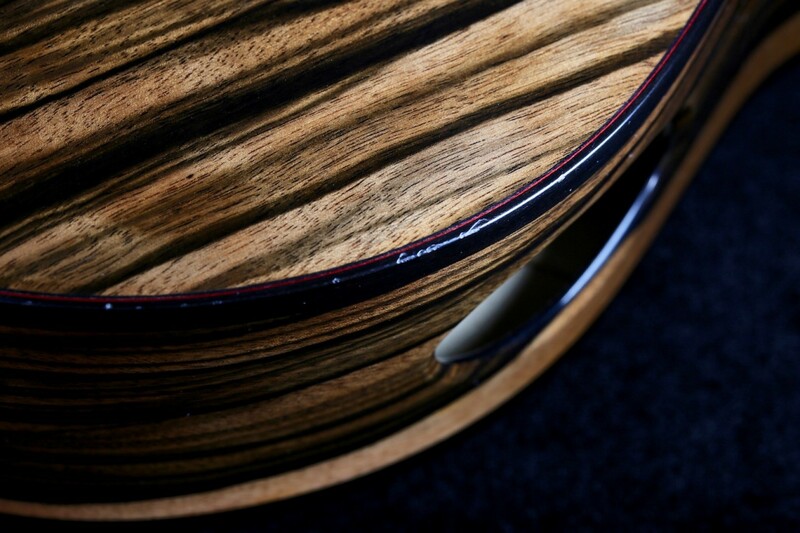 With respect of tradition and love for modern aesthetics, Mark continues this evolution with clear artistic vision, innovative technology and meticulous attention to details using the world’s finest tone woods. While building a multitude of different instruments, he maintains a keen focus on evolving the instruments – each one built with a specific ‘tone’ in mind and never at the expense of decorative amenities. For Mark’s sensibilities, he greatly limits decoration on his instruments. As a master at extracting the optimum tones from his instruments, Mark’s philosophy on decorative features is one that it never adds a new tone, it never improves the bloom of a note, or the sustain. 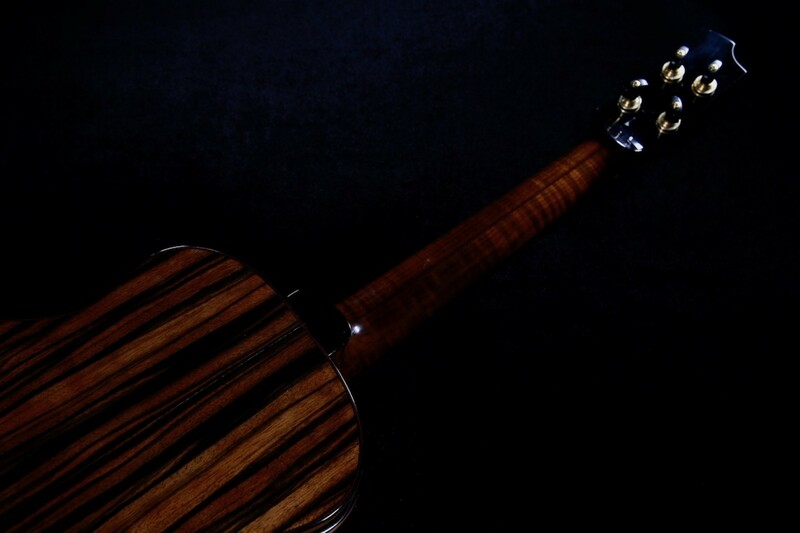 It never makes the the instrument play better…and it never makes the player reach to become equal to the capability of the instrument – and for that reason there is a pure element of beauty wrapped in simple elegance that encompasses the principle and tonal richness behind each of his marvelously handcrafted instruments. Mark’s instruments have been exhibited in the Museum of Contemporary Craft, and he has been a featured artist on Oregon Public Broadcasting’s Art Beat television series sharing his vision and work. He is a member of the Guild of American Luthiers, a contributing author to American Lutherie magazine, Guitar Maker Magazine, and his work was recently feature in Guitar Bench Magazine and Ukulele Rhythms Magazine. 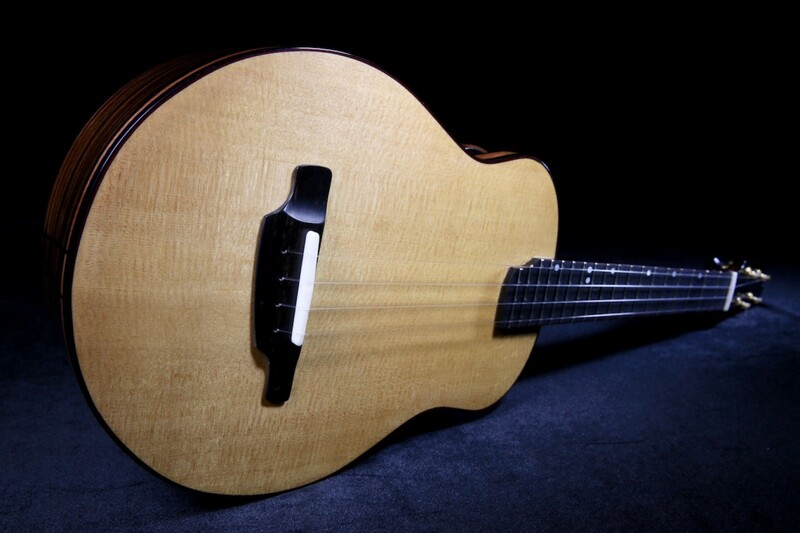 With an ever growing list of clients around the world, Mark is focused on evolving his designs and craftsmanship into museum quality instruments that may be past on as heirlooms for generations. 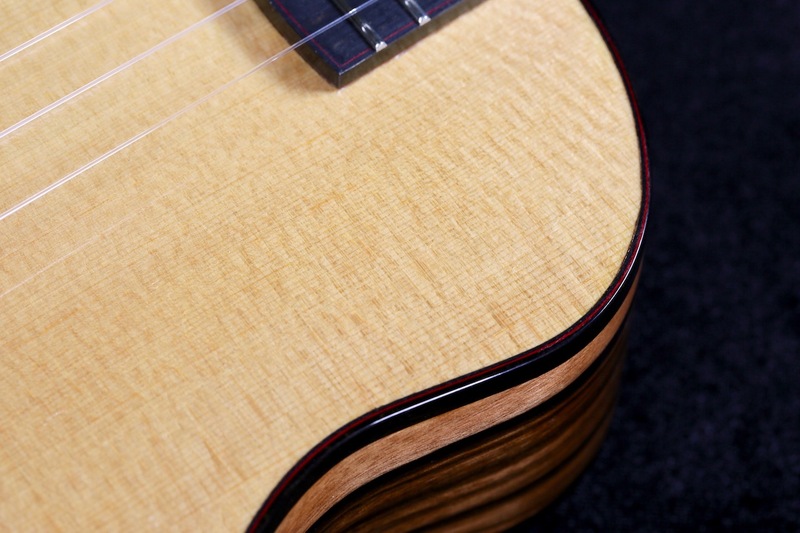 This beautiful T-14 tenor ukulele was built with a specific tone in mind. 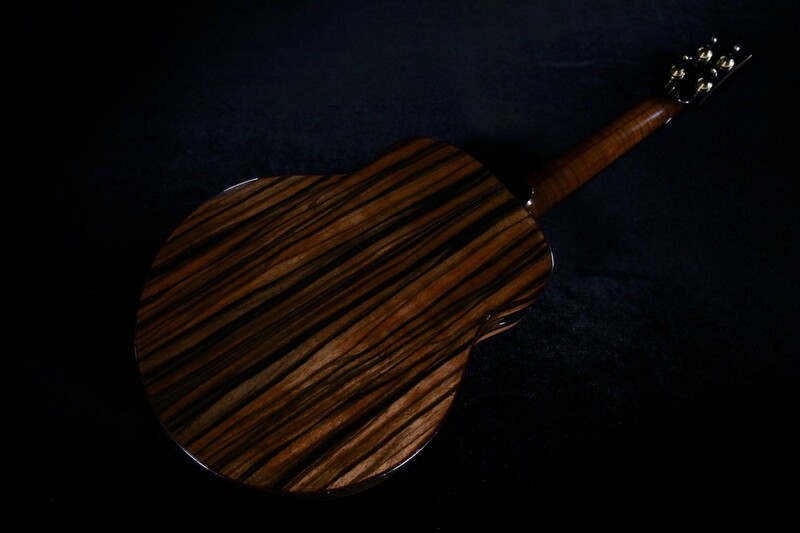 This design utilizes two dual “tuned” side soundports, traditional Kasha tonebars, and no soundhole on the soundboard. Mark typically utilizes Kasha or a Hybrid Kasha tonebars for his instruments tone definition. This allows for a defined tone of trebles, mids, and low tones; as well as a lot of sustain if desired; and he definitely builds for great sustain. A strum on this instrument will provide 10-15 seconds of sustain. 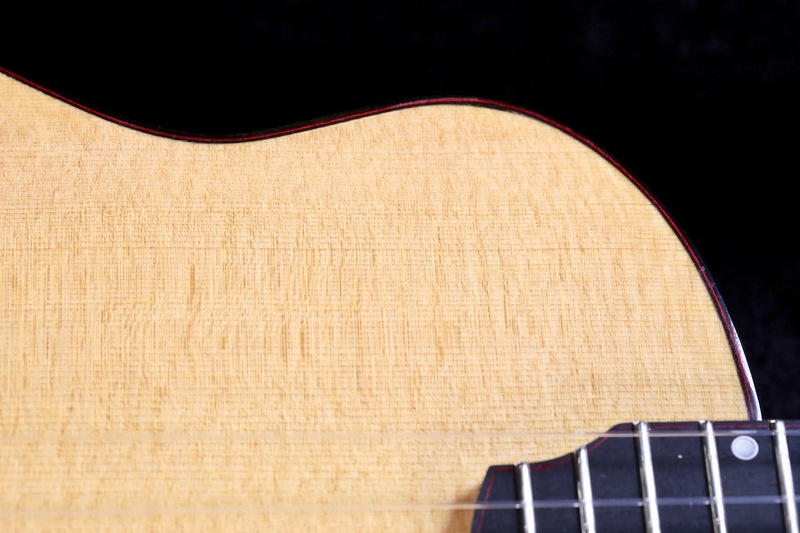 The tops and backs of the design are voiced for a specific tone, requiring great understanding of the balance between maximizing tone and ensuring structural integrity of the instrument. If you hold the body of one of his instruments in your hands while having a conversation you will feel the instrument vibrating in your hands, as it responds to the air tone waves around it. 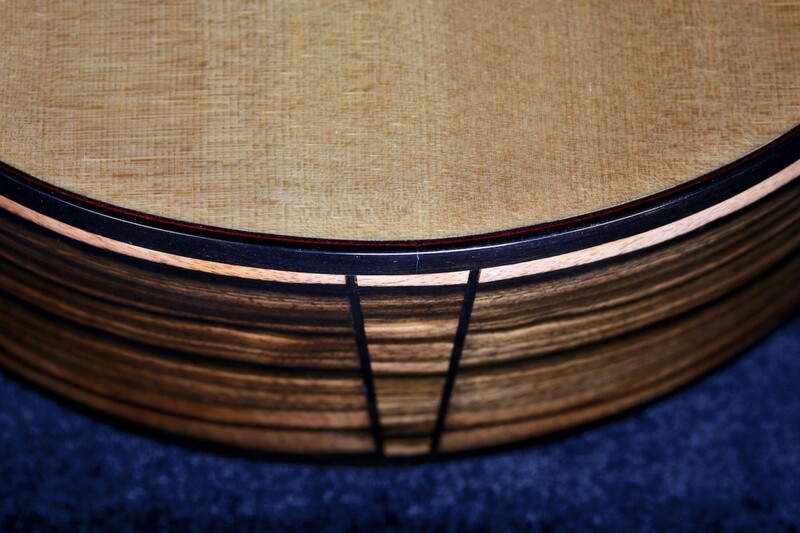 No soundhole on top. Mark has built several instruments with this design. The concept is based on how a speaker works. There is no sound hole on the front of a speaker. Only a vibrating diaphragm. 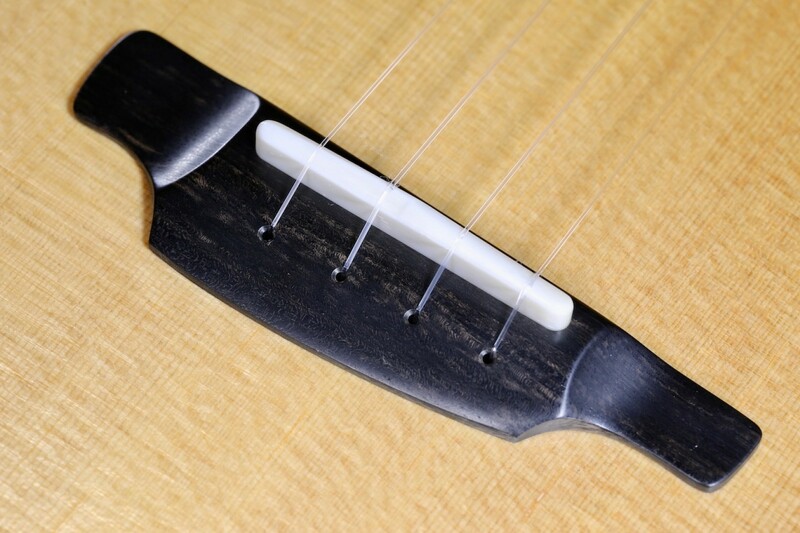 By eliminating a soundhole on the soundboard, the soundboard/body is not structurally weakened by the inclusion of the soundhole, so he doesn’t have to structurally brace for that weakness. As a result, he only adds tonebars to define the tone. This also allows him to build the soundboard thinner and to be more responsive, like a vibrating diaphragm. 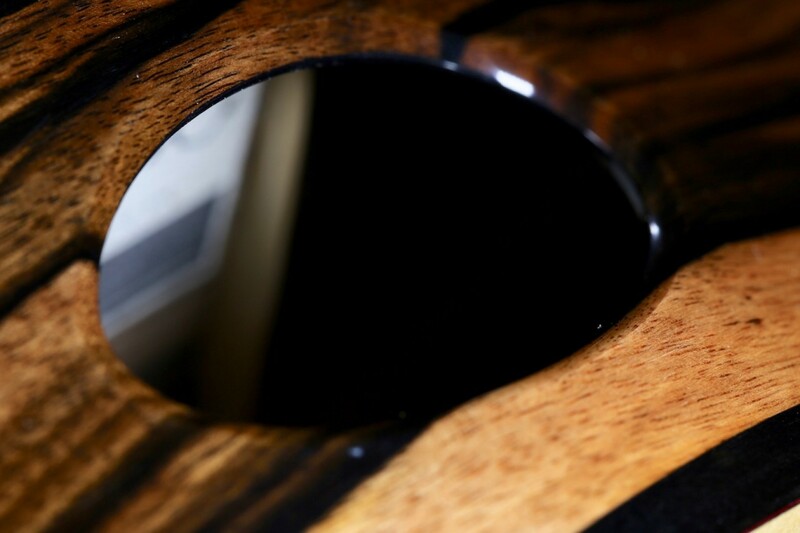 Dual “tuned” side soundports provide a face full of tone and volume for the player, but it is tone and volume balanced, and does not rob the same from being projected off the face of the instrument outward. 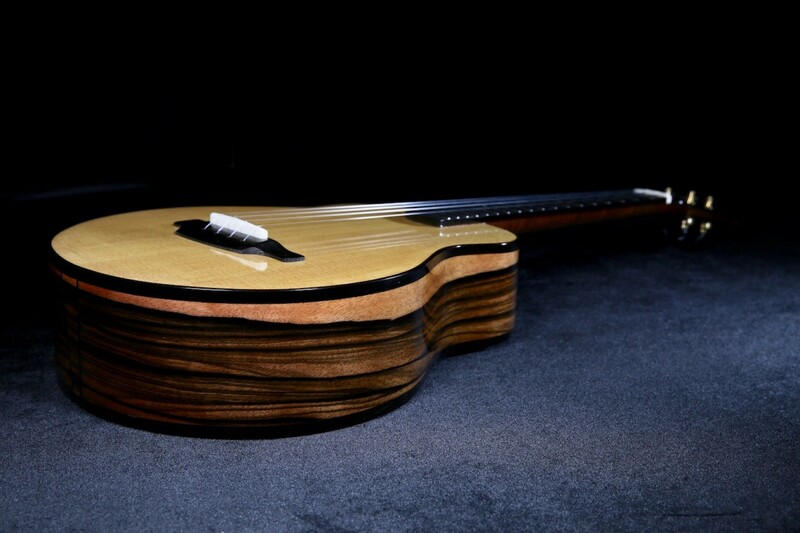 A “tuned” side sound port/s, has the combined sound holes on the entire instrument sized to allow the body air volume to work most efficiently for volume and tone for that one instrument. This will vary from model to model, size to size (tenor, bari, etc), and with variations in soundboard stiffness and bracing/tonebars. Vertical grain European Carpathian Spruce from Romania for the soundboard. 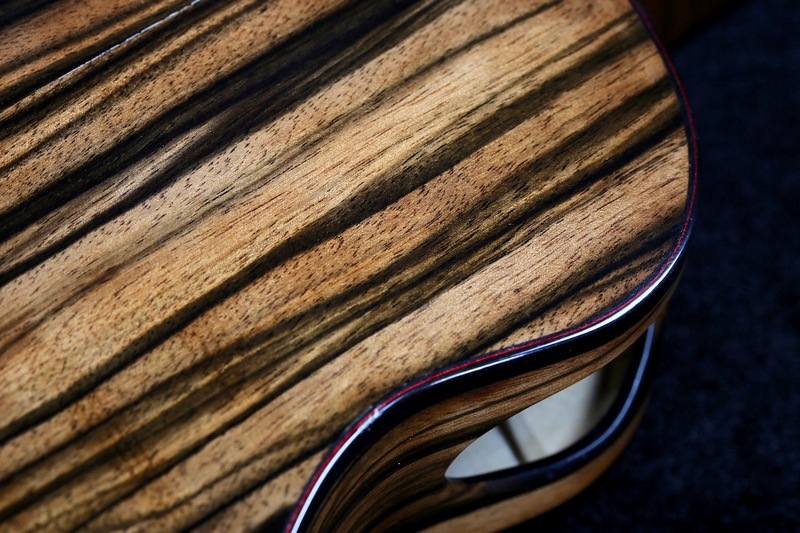 All of Mark’s fretboards are radiused, including this archtop ukulele. 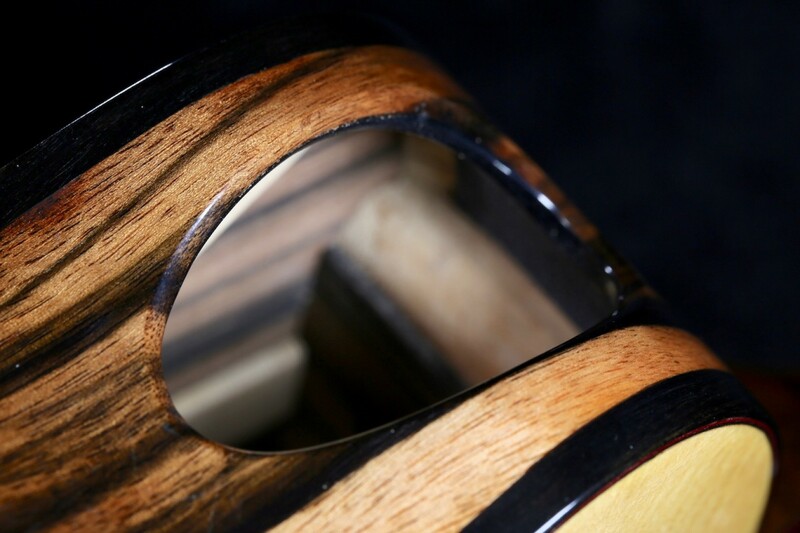 Typically a compound radius with 10” at the nut, and 16” at the upper end of the fretboard near the 18th fret. 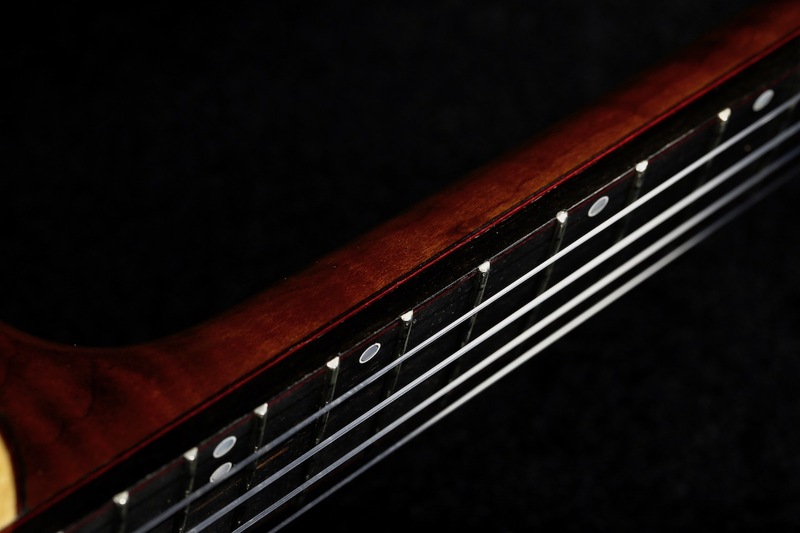 The neck also includes a carbon fiber truss rod (.250” x .200”) for additional neck stiffness. This helps transfer more string energy from the headstock end of the neck into the body, and is an overkill prevention on a uke to ever have any neck bending from string pressure. The truss extends under, and in contact with, the bone nut. Fretwire. Mark uses Narrow/Medium Japanese nickel silver fretwire. 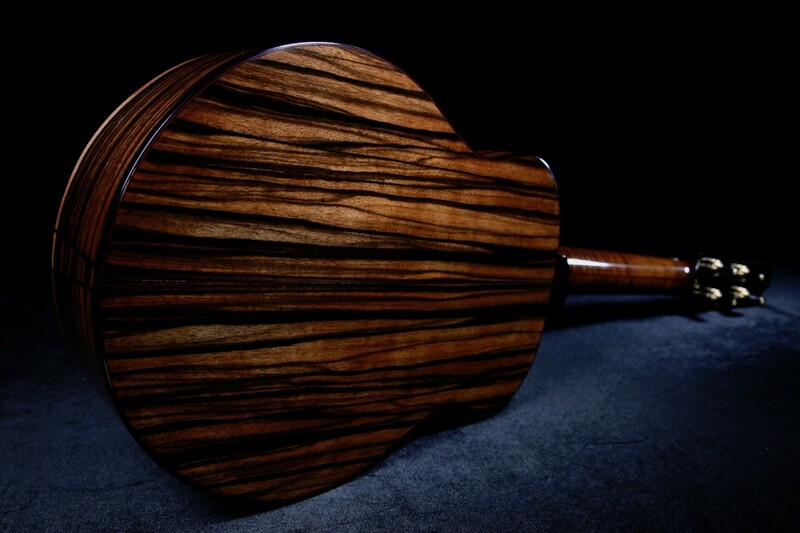 This is wider and slightly taller than most ukuleles. 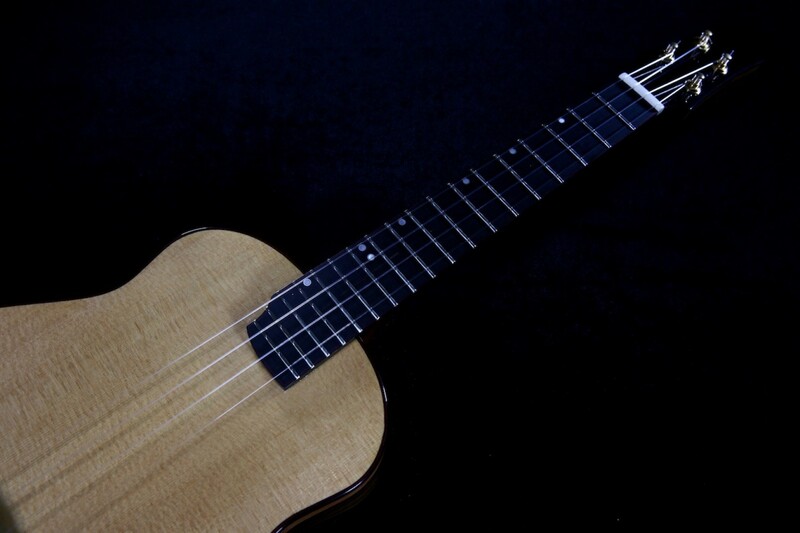 Typical ukuleles use a narrow/narrow wire, with a .053” width and a .037” crown height. Mark’s are ,080” width and .040” crown height. This is similar to Pre-War II guitars, banjos, and mandolins. The wider width comes in handy for people liking to bend notes. Body shape. 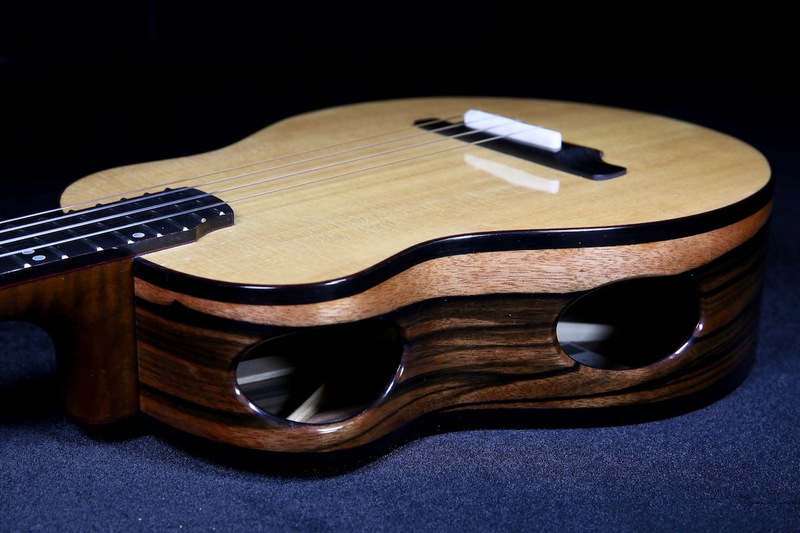 Mark created what he calls a T14’s body shape for this particular ukulele. He believes firmly in designing his instruments for a specific sound and functionality in mind and uniquely creates each body mold with these specific intentions in mind. 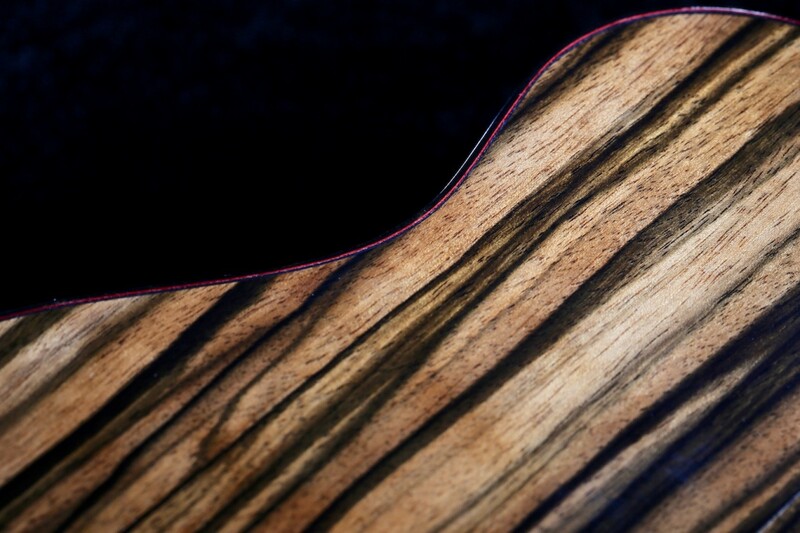 His T14 have the neck joining the body at the 14th fret. 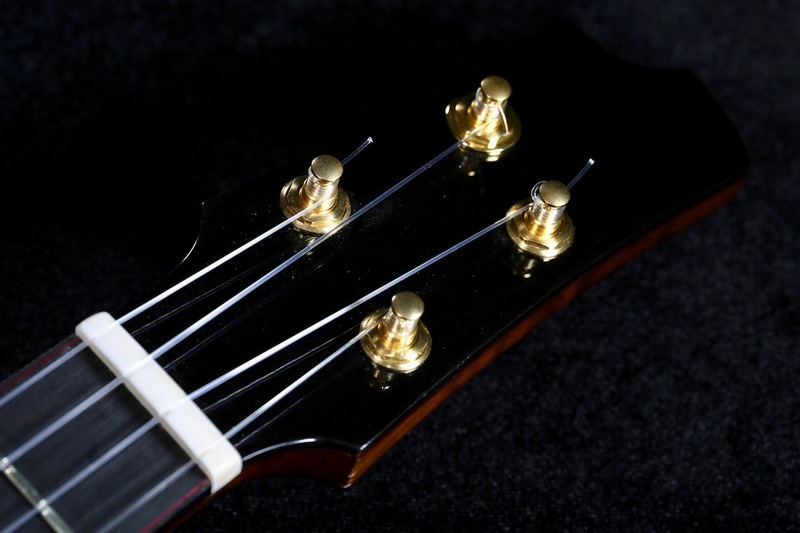 This allows for easy play high up on the neck with minimal intrusiveness. 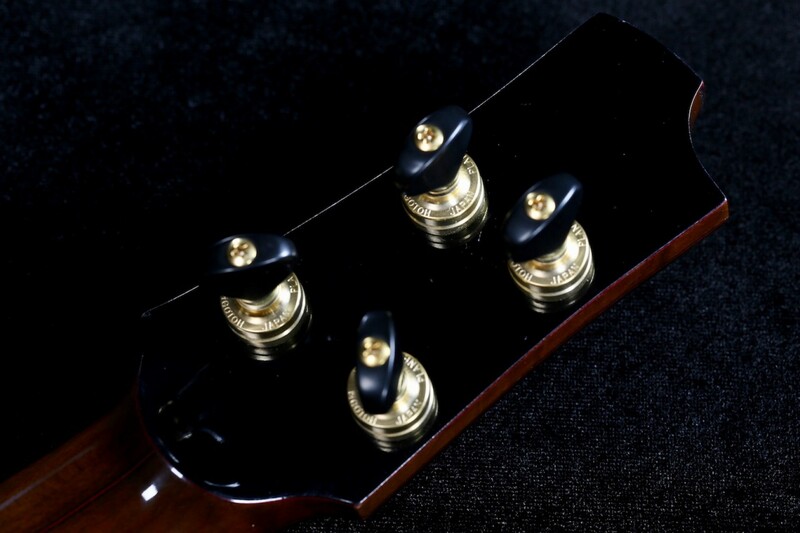 The body real estate that is reduced from the upper bout with this build is added into a more rounded larger lower bout, where most tone is generated. All of his instruments have the bridge/saddle located in the center of the widest part of the lower bout, where it can dynamically produce the most tone and volume.